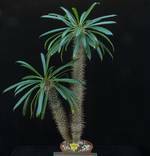 Succulent Pachypodium lamerei 5 from Dušan Hrovatin's personal collection of succulents is offered by the WYSIWYG principle (providing the exact image of the chosen plant before you order it). 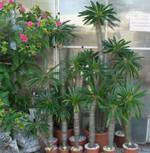 Pachypodium lamerei 5 sprouted in 2005 and is available for only32.00 €. Palma je visoka 60 cm z lončkom 75 cm. 2 stebla iz ene osnove. Raste počasi. Ne pošiljamo po pošti. Možen osebni prevzem.